HomeLord O’Donnell Suggests …. that someone rather like him should be put in charge of vetting government policy. Seriously? ← UKIP: Building a Party when the “Party” is Over? Might I suggest that during the former Cabinet Secretary’s appointments spanning a period of increasing sociotechnical complexity that little progress has actually been made to implement the necessary radical change so often identified as essential if the country’s public sector is to have requisite capability to evaluate policy. 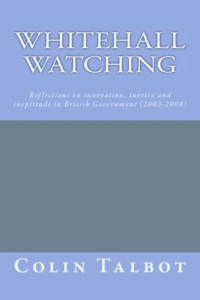 There are many, many, examples of this deficit but just to use one to illustrate the point (there are many others in the news every day) the updating of the Green and Magenta Books which are supposed to be about policy evaluation as this extract taken from the Introduction to latter identifies: The risk of not evaluating, or of poor evaluation, is that policy makers are not aware if policies are ineffective or, worse still, result in overall perverse, adverse or costly outcomes. Correspondence with the Treasury, who own the guidance, during this period identified that the approach was to be entirely orthodox; striving to do better what had been done before, an approach of sustaining innovation rather than the creative destruction of radical or disruptive innovation; moving beyond the comfort zone of the familiar to accept a heterodox approach that could replace the traditional 3Es with possibly 3Vs (Viable, Verifiable & Valid). As Einstein informed us: No problem can be solved by the same consciousness that created it. We need to see the world anew.” – But such reorientation takes leadership as well as good management. The proposal for an: Office of Taxpayer Responsibility (OTR) should assess policies, requiring the government to specify their objectives and explain how success would be measured is an activity that is supposed to be done today but isn’t because the tools of their trade are inadequate for the job; the responsibility of which must reside with the leadership within the Civil Service in Central Gov and Public Servants in Local Gov. One of the functions of the House of Lords is supposed to be that of a revising chamber (in its ping-pong role with the legislature of the Commons) this is the proper place for policy evaluation to be conducted – the Liaison Committee is currently exploring the roles of Committees which in reality need their own new tool box to improve decision making in complex non-linear service delivery, if they are to better understand (when there is a shortage of wisdom) the why as to what is systemically sensitive and thus important. Having once been a mentor for Civil Servants in a Gov. Dept. it was surprising how little understanding there was of the difference between the lexicon of the appointed vs. the lexicon of the elected; where too often capabilities (based on past experience) of the appointed were inadequate to the challenge of evaluating and implementing the policy (ends) of the elected – the traditional doctrine of operational tactics (means) being inadequate but still used to determine strategy (tail wagging dog) – to inform policy and provide direction to operational delivery. What resonated was good what reverberated was considered bad or inappropriate. To sideline the challenge of effective policy evaluation and identifying appropriate strategy it was again too often mentioned that the civil service aspired to be: more business like without being like a business! At first this seemed quite sensible, but then it became easier for the administration to believe they might overcome their difficulties if only they became: more like a business; this would allow common use business processes to become the norm in decision thinking; but the structure of business is different to that of the public sector, hence, we end up with increasing stress and conflict in the delivery system as it strives to deliver less than viable policy using verifiable means that are only valid to the function of inappropriate audit. I.e. building the wrong system right does not make it any less wrong. The former Cabinet Secretary’s opportunity was when in office; perhaps what is first required is a revised scrutiny process for appointing members to the Revising Chamber – the Upper House? In all cases – MInisters, Civil Servants, and Parliamentarians – you are looking for amateurs to develop policies. Better in my view to look for policies to be designed and vetted by people who actually know what they are doing.